Malta is urban despite its relatively unpopulated north. We live concentrated in an arc around Valletta. We often hear ourselves passing comments like “place X is too far away from nightlife or the hub of society to live in or drive to” when in fact it lies a mere 15 minutes away from Sliema or St Julian’s. Since that’s our mindset, and Malta’s planning authority (MEPA) is supposed to be saving what little virgin territory we have, most new development is taking place in the already built-up areas and it’s going high rise. Here, architecture student Sergei Mikhailenko discusses the reasons why the only way for Malta property is up, but also asks if Malta is tackling high rise the right way. A solution to the problem of space was developed in the US during the C20th century – the skyscraper. However, it brought its own set of problems – cultural, economic and environmental – such as social stratification, increased traffic, inadequate street layouts, decreased quality of light, wind and vegetation, and the ‘Urban Heat Island’ effect. In Malta, nostalgia and respect for historical buildings play important roles in the development of the country. In fact, many areas on the island are classified as Urban Conservation Areas where new development has to respect the existing urban fabric. Many of these areas were built on an old model of city. Streets were planned for pedestrians and horses making them narrow and organic and would wind around the highest building of the area – the baroque church. If we were to rehabilitate this kind of area using today’s technology, we would realise that the old model doesn’t fit the new. New city planning is based on fast, easy commutability and larger densities of people. If a high-rise were to be built in Valletta, it would create new problems, particularly of traffic, as larger densities of people imply larger densities of cars. Old vs new planning is just one issue. There is also a key cultural and economic issue inherent with high-rise development; that of social stratification. High-rises are considered a measure of wealth and power; the higher you go the wealthier and powerful you are (take for instance the towers of rival merchant families in medieval San Gimignano in Tuscany, Italy). We can all too easily end up with ghetto-isation: a situation in which wealthy people live in high-rise designated areas while the lower economic quartile of the population ends up in areas that could potentially turn into slums. Apart from the cultural, social and economic issues, there are the technical and environmental ones too. 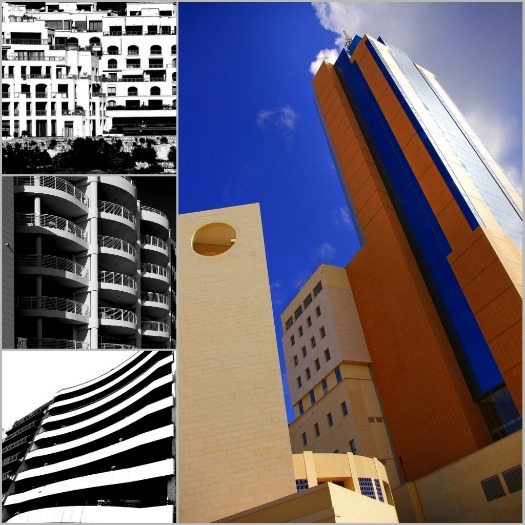 It is important to design high-rises bearing in mind the safety of inhabitants, the climate in Malta (sun, wind and rain patterns), the geological and seismic situation, and many other details which affect a given site and the erection of a building which is up to standard. Do we need more housing at all though? The Maltese population increased during the past years so more people have to be accommodated within a limited area. For this reason, MEPA (Malta Environment and Planning Authority) published the Structure Plan in which it promotes the increase in urban densities of already built-up areas. This will entail building higher buildings. According to a Eurostat report, the Maltese population is an ageing one; the fertility rate is low and more people are living to an older age. But it is predicted that the population will grow by 4.5% until the year 2035, and then drop below today’s population to 405,000. The only population growth would come from migration. The needs of the current population are different from the needs of the future population. At the moment we are a rising population, hence we need more dwellings. However, it might be the case that in the future we will need fewer dwellings due to the eventual decline in population. This will elevate the current amount of permanently vacant dwellings from a quarter to an even higher percent. Malta is a country rooted in tradition. In such a sensitive place one cannot design using the fully technological approach, instead we must compromise and keep in mind the cultural and social values which make up the identity of the country. The following list of examples sheds some light on the current state of development of high-rise in Malta – at whom they are aimed and what their intention is. The list includes contemporary buildings erected during recent years as well as buildings under construction together with their principal objectives. Are we taking into consideration the right issues when designing these high-rises? Do these objectives promote the integration of the old and new, of cultural and technology, of economy and environment? Will they fulfill the needs of the population as it grows and reduces? Is their purpose just to attract more (wealthy) migrants? What too of the resources (water in particular) of the country if migration population growth is their main aim? You be the judge. We quote from the developers’ write-ups, so enjoy the jargon. It spells out clearly that these high rises are all about prestige, luxury and exclusivity. Sergio’s architecture portfolio, click here. @Andy, good point re. urban creep. I’ve seen the village core in Siggiewi ruined by new blocks, whose building tore down a wonderful old, buttressed wall which was a main feature in the village centre. Gozo’s villages are nowhere what they were thanks to this ‘turn a blind eye’ village desecration. Liz, you’re absolutely right about the grant situation (or lack of it). And to clarify, I’m totally in favour of renovation projects, and even redevelopment and re-purposing of brownfield sites. If a building isn’t fit for purpose and nobody wants it, by all means tear it down and build something better in its place. What gets me is the number of decaying apartment block shells or completed but unoccupied blocks built on greenfield sites on the edges of villages and in semi-rural areas, which ruin the little landscape that Malta has left. To me they indicate that MEPA is failing to judge whether a proposed building project will actually be completed within a reasonable time by the developers, and whether it will easily be sold or rented on completion. Villages across Malta have been expanding inexorably for years, eating up greenfield land instead of re-using brownfield sites, and at the current rate of development it’s probably just a matter of time before (for example) Zebbug and Siggiewi merge into one big conurbation, like Attard and Lija did years ago. @Andy, I completely agree. Trouble is that the type of (generally older) property that is vacant isn’t the sort of property that new buyers want – whether migrants or locals. Older houses needing loads of renovation only to still be cold, damp and miserable come winter? Newbie expats and young Maltese aren’t favouring these empty older properties. Hence the imbalance you mention. Now if government were to give substantial grants to help us upgrade older places, things might move that way. I would respectfully disagree, because I think we should take into account the immense number of empty and part-built properties that already exist (over 53,000 in 2007 – probably much more now). I feel quite strongly that there should be NO new residential development (high-rise or conventional) absolutely anywhere on the islands until at least 90% of these properties are occupied. This of course will never happen because the government is too scared to regulate the construction industry to that extent – and because the same government department is responsible for both planning AND the environment – a clear conflict of interest. Sorry, you seem to have touched a nerve!